First of all, the vaccine does not treat an existing virus. 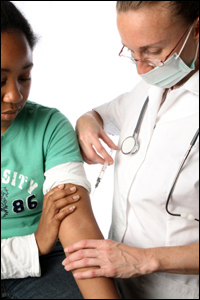 Being vaccinated against HPV protects you against strains 6-11 (Low Risk types, which cause genital warts) and 16-18 (high-risk types, which cause cervical cancer). Even if you are infected with one or more of these types, get the vaccine to prevent the others. Lets be very clear, "Gardasil" vaccine covers only four strains, there are 11 more high-risk types. Now on the subject of mass vaccination of girls starting at age 13. Is it a good thing? The answer is yes. In fact, it's quite obvious we will need to vaccinate boys as well, when testing is complete. The only way to control this virus is by treating both male and female. There will always be people who oppose vaccinations, as well as those who support. This should not be a political issue. Some people suggest that vaccinating girls will entice them to become promiscuous. This is absurd and insults the intelligence of our young people. Yes, there is a certain care free attitude in our early years, but to suggest young women have no common sense is going too far. The teen of "today" is well aware of many STDs including HIV. Unfortunately, most young people have no knowledge of HPV. In fact a 2007 survey of 100 college students, who were asked STD related questions, showed that most had never even heard of HPV. yours. Only you can make that decision.